The Powell street station is right under Westfield Mall (Nordstroms is shown). As seen from Fisherman's Wharf, more information here. 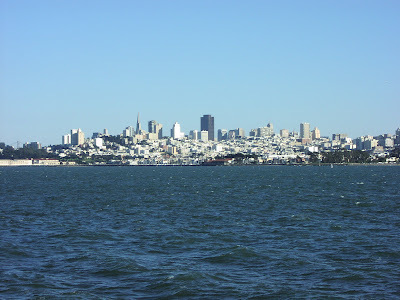 The San Francisco skyline from a bay tour boat. St. Peter and Paul church is located in north beach. This picture is across Washington Park, it looks a bit crooked, but there is of course a hill. It is a neat neighborhood to explore. The cafeteria is closed has many more pictures of the church. 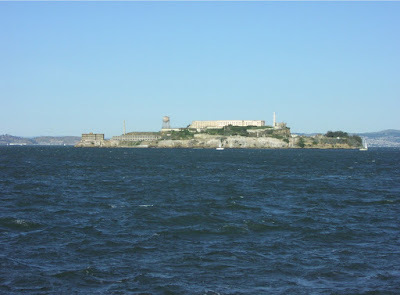 How many times has a similar picture been taken of Alcatraz in the San Francisco Bay? This picture does have one thing going for it (and only one...) its a sunny day, instead of the usual fog!